Following their success at the CIR Risk Management Awards 2015, Network Rail have won the Institute of Risk Management (IRM) Global Risk Awards 2016 for 'Innovation through Technology', using SharpCloud for Enterprise Risk Visualisation. IRM's Global Risk Awards are the risk world's answer to the Oscars, to honour and celebrate individuals and teams that have made significant contributions and paved the way for innovation and excellence in risk. 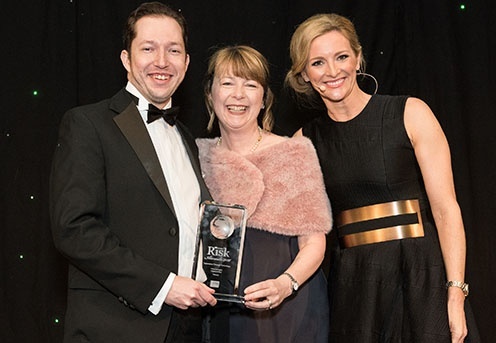 The Institute of Risk Management (IRM) announced the winners of its Global Risk Awards at a glittering ceremony, hosted by TV celebrity Gabby Logan, on the 15th April at the Park Lane Hilton, London. The Awards, now in their fourth year, recognise and celebrate enterprise risk management excellence across the world. Nearly 400 international risk leaders converged in London from over 40 countries and a total of 17 awards were presented to winners. Network Rail were one of those deserving winners, taking home the ‘Innovation through Technology’ award, for their use of SharpCloud Software in visualising risk. The risk environment is evolving increasingly swiftly, presenting organisations with new challenges, threats and opportunities. Awards in the Innovation and Excellence category recognise individuals and organisations who excel at meeting these challenges. The Innovation through Technology award is aimed at organisations who consider that they have developed and/or implemented a successful technological solution which has added demonstrable value. "We are delighted to be recognized by the prestigious IRM Global Awards 2016 for our innovative approach to configuring, implementing and benefiting from using SharpCloud to tell our Enterprise Risk story to our board, internal and external stakeholders. It is exciting to be a part of SharpCloud's story and journey, and we look forward to utilising the latest functionality to realise even more benefits from this groundbreaking platform." Nico Lategan, Senior Enterprise Risk Specialist, Network Rail. SharpCloud are equally proud to be working with the risk team at Network Rail and for this second award to have been achieved, after less than twelve months implementation of the software, is hugely rewarding for all involved. Today’s Risk Managers need to be able to engage in real-time stories with the right data, and report time and relationships across multiple projects quickly and efficiently. Being able to communicate complex issues to all levels of the business and keep them engaged and interested is nearly impossible with static, linear presentation software. SharpCloud is a visual communication tool that allows you to create interactive, non-linear, highly detailed and engaging content, called stories. You have the ability to visually discuss updated data and collateral instantly, from a range of mobile platforms and have critical conversations with stakeholders about your enterprise risk management process in real-time. Helen Hunter-Jones, Head of Group Risk, Network Rail.